Become a Pattaya tourist on your next Thailand vacation as it is one of the few beaches close to Bangkok and well worth a trip. You can visit the beach at Pattaya at any time of year, as not only is there the large Pattaya beach, but there are many tourist attractions here as well. 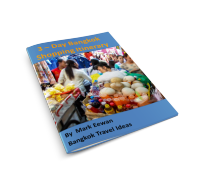 The frequent bus and van transfers from Bangkok make it all the more convenient to get to. You can even take the bus to Pattaya from Suvarnabhumi Airport. 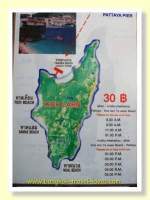 Are you interested in being one of the many Pattaya tourists who visit the Pattaya beaches for a short break or perhaps thinking of becoming a longer term resident? Well if you are, let me tell you a little about Pattaya. 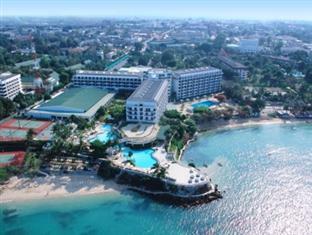 Pattaya Bay is a large half moon shape with Pattaya Beach road following the shoreline all the way from the Dusit Thani Hotel to Walking Street. 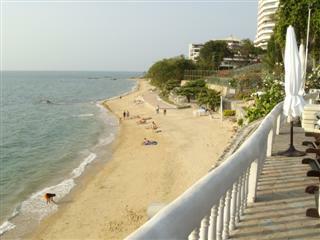 The town is divided into North Pattaya, Central Pattaya, South Pattaya and Jomtien Beach. 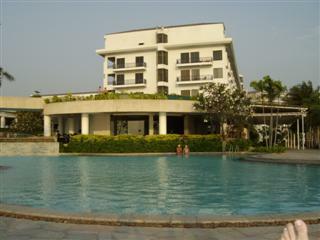 Pattaya North is more subdued and family friendly and less commercial than Pattaya South. Pattaya beach area is set out with deckchairs and umbrellas to shield you from the sun and market vendors dart between the umbrellas selling all sorts of things. 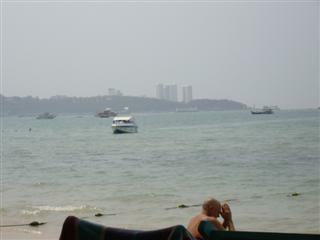 If you decided to sit on Pattaya beach you can order a beer, snack on seafood or read the newspaper and relax. You will see many Pattaya tourists doing just this. During the day vendors come around offering food, massages, massage oil, fluffy toys, sports shirts, sunglasses, watches and DVD's. Did I miss anything out? I am sure I did. Most of the items on offer can be purchased in the town much more cheaply, but if you really need that set of toenail clippers right now, then be my guest and bargain away. If you are trying to sleep on the beach it can get a little annoying, to keep fending the constant requests, but they're just trying to earn a living so be polite to them when you tell them you are not interested. By the way, if you see them make a mad dash for the road all at once, that is because there is a policeman somewhere about. They are not actually allowed to trade on the beach so they run off as quickly as they can to get to safe ground. During my last visit I suffered a serious case of sunburn, it was my own fault as I fell asleep on the chair besides the pool before putting on the sunscreen. 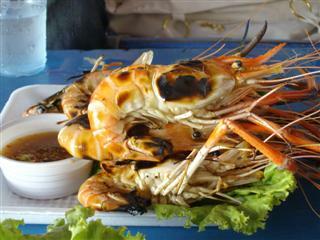 In fact this is one feature that distinguishes the inexperienced Pattaya tourist. A red nose and a pained expression when they walk as they try to avoid the clothes touching the skin. A sad sorry sight indeed. I should have known better, but anyway a lesson learned. So for something to do, as I couldn't swim or lie down, I walked all the way from the Dusit Thani hotel in North Pattaya down to Walking Street in South Pattaya. It was very relaxing just sauntering along looking in the shops along Beach Road, dodging the Indian tailors and checking out the t-shirt bargains. All the time being careful that my hair shirt did not rub on my sore and tender skin. I will never forget the Indian tailor who greeted me on the street wearing the worst striped suit I have ever seen. I should have taken a photo because he was a sight to behold. He must have had some left over material and decided to turn it into a suit rather than waste it. It was a shocker... and I couldn't help but laugh when he approached me. Surprisingly he thought the suit looked fine. Oh well there is no accounting for taste. Maybe he hoped that a Pattaya tourist could be convinced to buy same. Having reached Walking Street and decided that I had walked far enough I turned around and ambled along the foreshore to get back to the Dusit Thani hotel. I think it probably took me a couple of hours all together. 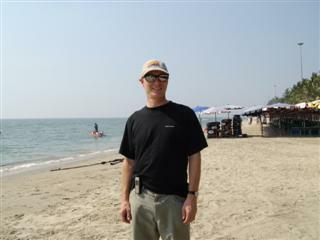 If I hadn't have had the sunburn I would not have considered this walk along Beach Road Pattaya. All in all it was a very relaxing afternoon and after having a shower in my room I went back to the beach for a foot massage, pedicure and manicure. I think that cost about 300 Baht. Luckily the tops of my feet were only mildly sunburned so the foot massage was not painful like I expected. Whilst having my massage I saw this Pattaya tourist who was feeling a little spiritual. Or maybe he just had a bad night. If you don't like to walk, then you can get on any of the songtaew's that drive around the city and for 10 Baht you get off where you like. Songthaew's are customised pickup trucks with bench seats in the rear for 10-12 passengers. The songthaew's (also known as a Baht Bus) do a circular route through Pattaya along Beach Road and return along Second Road. The songthaew's stop upon request, so coming back is no problem either, no matter where your hotel is located. 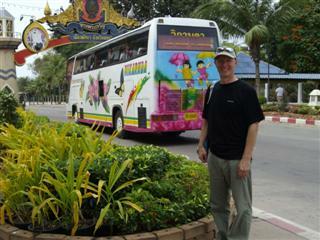 There are very few taxis in Pattaya, so don't expect to hail one at the side of the road like you do in Bangkok. It is pretty much either a songthaew or a motorbike. I read recently that you don't need a drivers licence to drive in Pattaya. Hmmm, I don't think I would take that advice too literally and in the event of an accident I think you may find it quite handy to have a drivers licence and preferably an International Drivers licence at that and make sure that your travel insurance covers you. 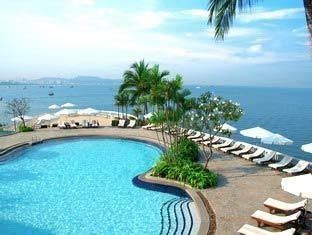 The Dusit Thani hotel is located in North Pattaya not far from Pattaya bus station. 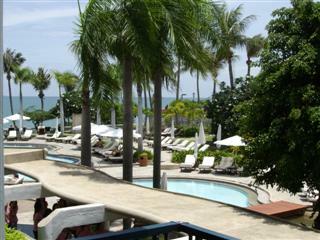 It has a superb swimming pool and its own private beach. 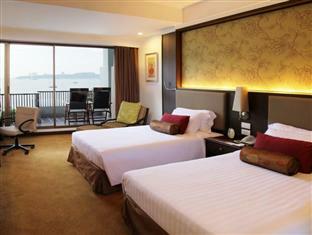 The Dusit Thani hotel can be booked at Agoda travel. If you are a member of the Royal Orchid Plus frequent flier program with Thai Airways then the Dusit Thani Pattaya is on the list of hotels that you can use the hotel vouchers with. This is extremely good value for a two or three night stay and the booking process is very straightforward. With these vouchers you get to stay for the cost of the hotel taxes. 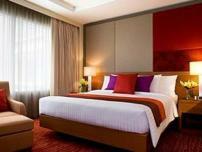 Regular bookings, depending upon the season have rooms that seem to start at about 4200 baht. 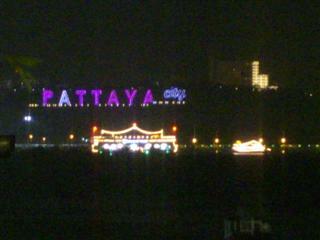 At night you get the view across the bay and can see the Pattaya city sign in South Pattaya. 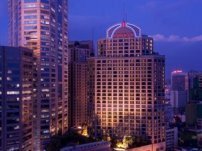 If you would like to know more or book the Dusit Thani Hotel﻿then go here to Agoda Bangkok travel. If you fancy becoming a Pattaya tourist and are not sure how to go to Pattaya then just follow this link for transport options from Bangkok, or go here to get the bus to Pattaya from Suvarnabhumi Airport. If the thought of visiting the Pattaya tourist attractions does not appeal to you, then considering going just a few miles further on, to the beautiful island of Koh Samet.